Once the snow melts, bright, bold colors are on the horizon. Why carry that boring, black bag that you've used all winter. Trade out the winter bag for a gorgeous, new Kate Spade tote for Spring. The bright colors are perfect for Spring and Summer. Show off your new look. 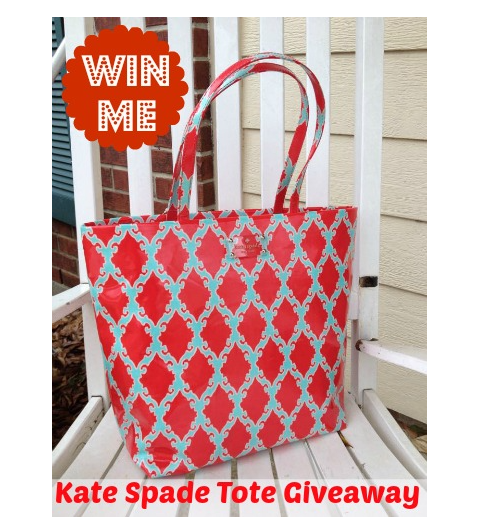 Win a Kate Spade Tote! Spring is here and what better way to celebrate it but with an awesome designer bag giveaway. Together with my blogger friends we’re giving you a chance to win an authentic Kate Spade Bon Shopper Tote Bag. Spring fashion is all about bright colors and prints, and this Kate Spade bag is the perfect accessory to add a pop of color to your spring outfit. Please wait for the rafflecopter to load above. Make sure to come back daily to send your daily entries for more chances of winning. Giveaway is open to US only and runs from 3/23 (Monday) 7pm EST through 4/10 (Friday) 11:59pm EST. My spring fashion tip is to were colorful light weight clothes with a nice sweater for those cool evenings! My best tip is to wear pastel colors. My tip--wear fun pastel colors! Sandals too! Make sure your feet game is always on point! Always dress in layers and watch for rain. My best Spring fashion tip would be to dress in layers and to make sure you get pedicures if you are going to be wearing sandals. My favorite spring tip is to wear/carry bright colors. The winter is finally over, I like to celebrate with colors. Pedicures are a must if you are wearing sandals! Dress in layers, it tends too cool down quickly in the evening. I like to wear pastel colors in the spring. My favorite spring tip is to buy light colored skirt as they are easy to match with any tops. My tip for any season- buy good quality basics and then have fun with the accessories, which you don't necessarily need to spend a fortune on. Wear some nice bright colors with some offsetting accessories! My top is to dress in layers because the changes in The weather.